A supernova is a dying star. In a last moment of brilliance a supernova can shine brighter than an entire galaxy. There is still much we don’t understand about supernovae, in part because of how difficult they are to observe. Since we can’t predict when a star will explode, we typically discover supernovae after they have brightened significantly. Ideally we’d like to know where and when a supernova will occur before it happens so we can observe one in its entirety. Thanks to the effects of general relativity, we can. In general relativity, spacetime is warped by the presence of mass. Because of this warping, light can be deflected from a straight path, an effect known as gravitational lensing. The effect was first observed by Arthur Eddington in 1919, but is most commonly observed when light from a distant galaxy is deflected by a closer galaxy on its way to reaching us. This lensing effect often produces multiple images of a distant galaxy as its light reaches us along different paths. Light from a distant galaxy is lensed to produce multiple images of the galaxy. Credit: NASA & ESA. The speed of light is finite, so it takes time for light from a distant galaxy to reach us, often billions of years. Since the images of a galaxy come to us along different paths, each having a slightly different distance, the time it takes light to reach us along each path is different. This means each image of the galaxy we see is from a slightly different time. Normally this is insignificant, since galaxies change very slowly. But a supernova occurs over a short period of time, so it can appear in one image of the galaxy first, only to reappear in another image years later. 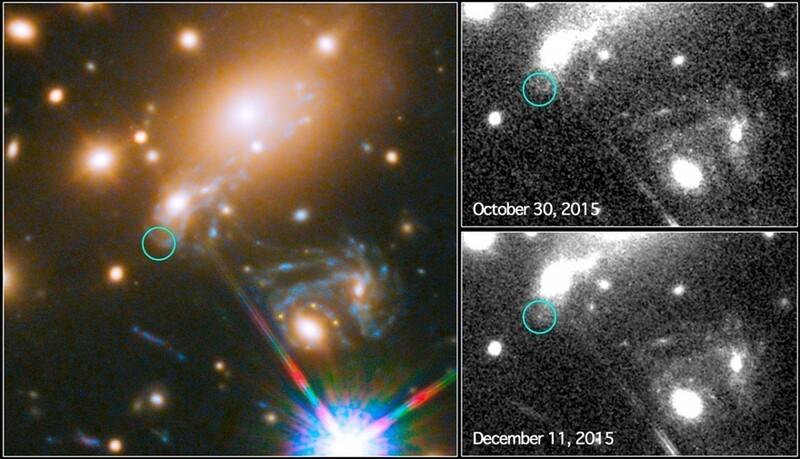 In 2014, astronomers observed a supernova in a galaxy known as MACS J1149.5+2223. 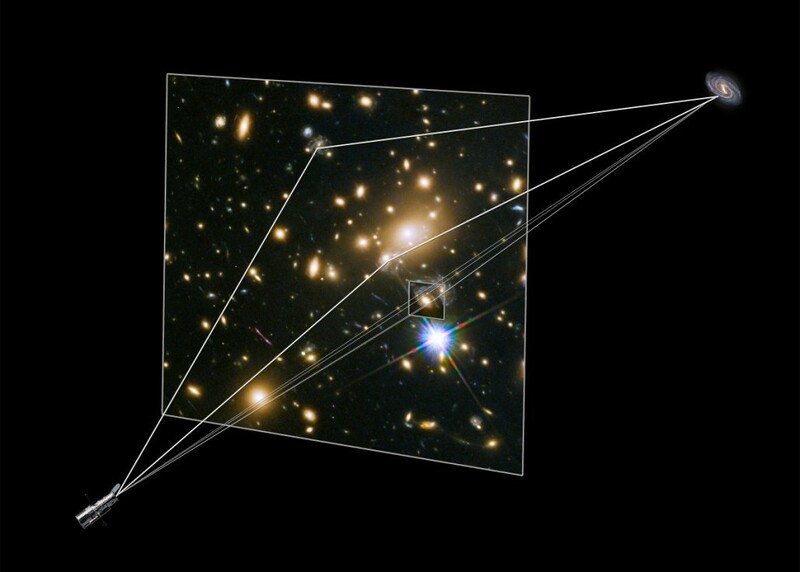 Because of gravitational lensing, at least three images of this galaxy can be seen. Using computer models they calculated the path distances of these multiple images, and determined that the supernova should appear in another galaxy image sometime between 2015 and 2020. They’ve been keeping an eye on the galaxy, and this month they were rewarded with a new appearance of the same supernova. The supernova has been nicknamed Refsdal after the Norwegian astronomer Sjur Refsdal, who first proposed the idea of time delayed supernovae in 1964. It’s so cool to think that supernovae also have reruns. So does this exemplify that we see (are seeing) this supernova Refsdal in space-time travel on a light path level (a.k.a. gravitational lensing)?